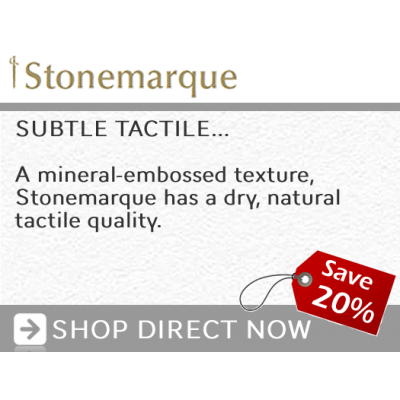 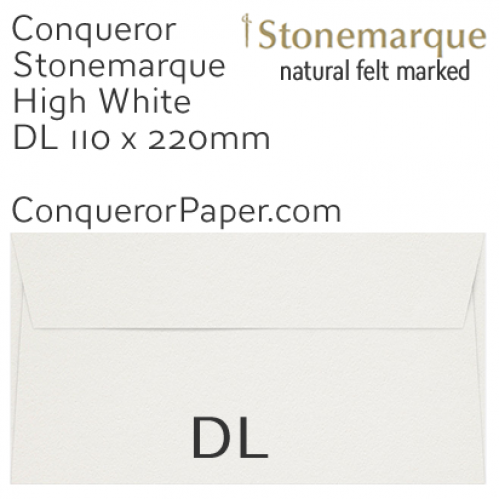 Conqueror Stonemarque has a beautifully soft, natural, random felt mark to enhance any of your communications. 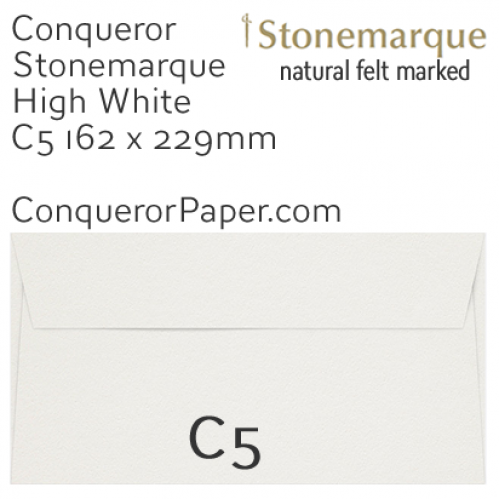 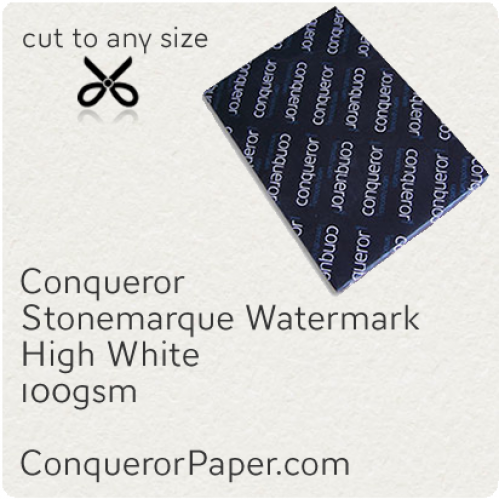 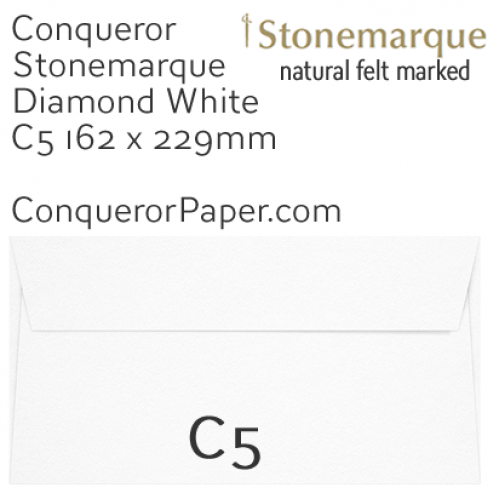 Conqueror Stonemarque paper and envelopes are a one off beautifully soft, natural random feltmarked paper product of real quality. 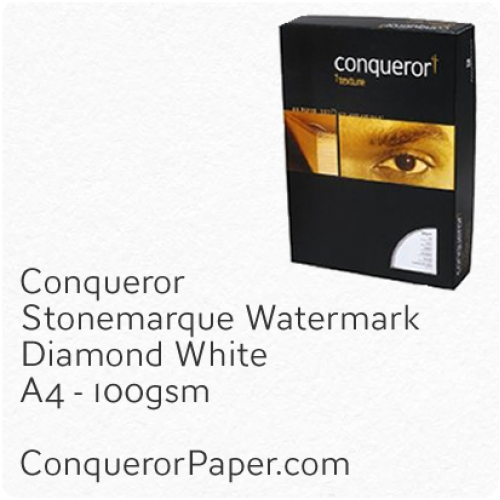 Buy here today to earn reward points for money off your next purchases. Prestige Envelope Brand CONQUERORWINDOW = NoSIZE DL = 110 x 220mmTYPE = Wallet (flap on long edge)FLAP = Super Seal (Peel and Seal)COLOUR = Diamond Wh..
Prestige Envelope Brand CONQUERORWINDOW = NoSIZE DL = 110 x 220mmTYPE = Wallet (flap on long edge)FLAP = Super Seal (Peel and Seal)COLOUR = High White..
Prestige Envelope Brand CONQUERORWINDOW = NoSIZE C5 = 162 x 229mmTYPE = Wallet (flap on long edge)FLAP = Super Seal (Peel and Seal)COLOUR = Diamond Wh..
Prestige Envelope Brand CONQUERORWINDOW = NoSIZE C5 = 162 x 229mmTYPE = Pocket (flap on short edge)FLAP = Super Seal (Peel and Seal)COLOUR = High Whit..
Prestige Brand CONQUEROR Paper High Quality TINT: Diamond White FINISH: Stonemarque PAPER: 100 gsm SIZE: A4 - 21..
Prestige Brand CONQUEROR Paper High Quality TINT: Diamond White FINISH: Stonemarque PAPER: 120 gsm SIZE: A4 - 21..
Prestige Brand CONQUEROR Paper High Quality TINT: Diamond White FINISH: Stonemarque PAPER: 160 gsm SIZE: A4 - 21..
Prestige Brand CONQUEROR Paper High Quality TINT: Diamond White FINISH: Stonemarque PAPER: 220 gsm SIZE: A4 - 21..
Prestige Brand CONQUEROR Paper High Quality TINT: Diamond White FINISH: Stonemarque PAPER: 300 gsm SIZE: A4 - 21..
Prestige Brand CONQUEROR Paper High Quality TINT: High White FINISH: Stonemarque PAPER: 100 gsm SIZE: A4 - 210x2..
Prestige Brand CONQUEROR Paper High Quality TINT: High White FINISH: Stonemarque PAPER: 300 gsm SIZE: A4 - 210x2..
Prestige Brand CONQUEROR Paper High Quality TINT: Diamond White FINISH: Stonemarque PAPER: 100 gsm SIZE:&n..
Prestige Brand CONQUEROR Paper High Quality TINT: High White FINISH: Stonemarque PAPER: 100 gsm SIZE: ..
Prestige Brand CONQUEROR Paper High Quality TINT: Diamond White FINISH: Stonemarque PAPER: 120 gsm SIZE:&n..